The WCTU acted and helped to create an institution that is approaching its 125th anniversary of its opening. The Orphans Home is now known as the Annie Malone Children & Family Service Center. Over that time, the Annie Malone organization has seen tremendous changes in how American society cares for children and families in distress, moving from large residential facilities toward helping children stay with their families. Its history also tracks changes in race relations and the position of African-Americans in St. Louis, progressing from segregation to integration. The Orphans Home, which began on property bought by African-American Civil War veterans, moved to the Ville neighborhood in 1927, using funds contributed by its richest and most-famous resident at the time, Annie Malone. The home was renamed Annie Malone Children’s Home in 1946. Changes in federal funding and state programs in the past 10 years caused Annie Malone to close the traditional Children’s Home and open a short-term residential facility in a new campus of buildings it bought in 2008 at 5355 Page Blvd. Boyd sat down for an interview in the cafeteria of Emerson Academy Therapeutic School, one of the programs in Annie’s Place, the facility on Page. He was there for the center’s annual Christmas musical program and dinner. Students at Emerson, children living in the center's respite and crisis-care area, and young adults living in the Transitional Living Program across the parking lot came together Thursday for songs, presentations and food in celebration with their families. Marquita Farland came to the party with her son Leondis Clark, 14, who attends Emerson. Marquita Farland and her sons (from left) Leondre Clark, 18, and Leondis Clark, 14. Students are placed at Emerson by St. Louis Public Schools for various special-education needs. A school advocate advised Farland that the suspensions were inappropriate. The advocate and Leondis’ teachers developed an IEP – individual education plan – for him and placed him at Emerson. Emerson’s goal is to move children back into regular schools, and Leondis expects to enter high school next year as a freshman. “He’s extremely excited about going to high school,” Farland said. Many Emerson students come into the school from middle school and high school, said Jonathan Haynes, the school’s science teacher. “For an alternative school, we move the students kind of fast,” he said. Most students stay about a year. 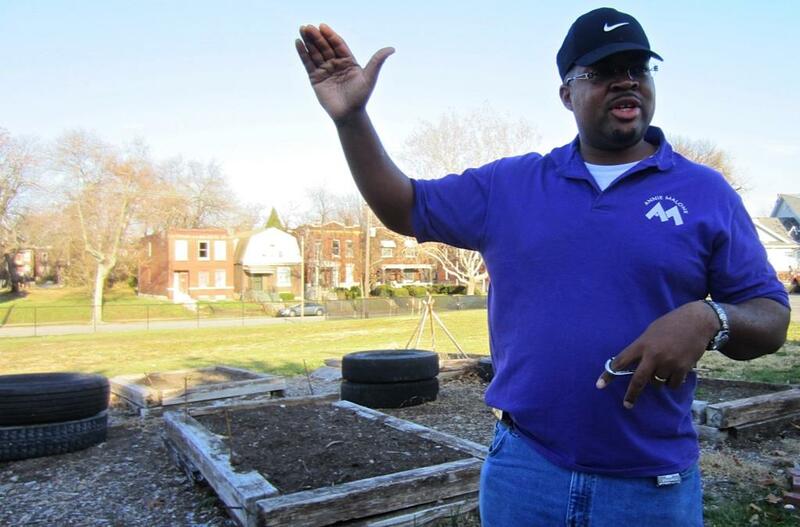 Emerson Academy science and technology teacher Jonathan Haynes shows off his students' combination beautification and gardening project behind the school on Page Boulevard. The raised garden plots and soil-filled tires are used to grow vegetables for the school's kitchen. And the tires are scavenged from lots in the neighborhood. Like the other teachers at Emerson, Haynes tailors his lessons to the learning styles of the students. He takes hands-on science literally, especially with the school garden. One afternoon recently Haynes showed some visitors a couple of dozen discarded tires the students collected around the neighborhood. “We will repurpose them,” he explained. That is, he’ll supervise the kids as they fill the towers of tires with dirt and turn them into planters. “At home, Grandma won’t let them get dirty,” Haynes said. “We let them take a shovel and experiment with dirt.” The garden project helps Haynes teach planning, plant selection and the effect of weather, climate and light conditions on plants. At harvest time, all the students got to take pumpkins home from the garden. Emerson Academy is a product of changes in the education of disabled children, away from specialized institutions and toward mainstreaming in the general population. In the same way, the center has moved with a national trend away from long-term residential treatment such as orphanages and toward short-term respite and crisis care for children whose families have difficulty caring for them. A few days before the Christmas program, Adrianne Martin stood in one of the bedrooms used for crisis and respite care, talking about her efforts to introduce lively colors: pink and purple for the girls, blue and yellow or a rich gray for the boys. “It’s all about creating positive vibes,” said Martin, the center’s director of social services. She stood in a room with four beds provided for girls 13 to 17, with bedspreads covered with big pink and purple polka dots. Besides the bedrooms and adjoining bathrooms, the crisis/respite facility has a kitchenette, space for private conferences, and space for kids to spread out and do their homework. 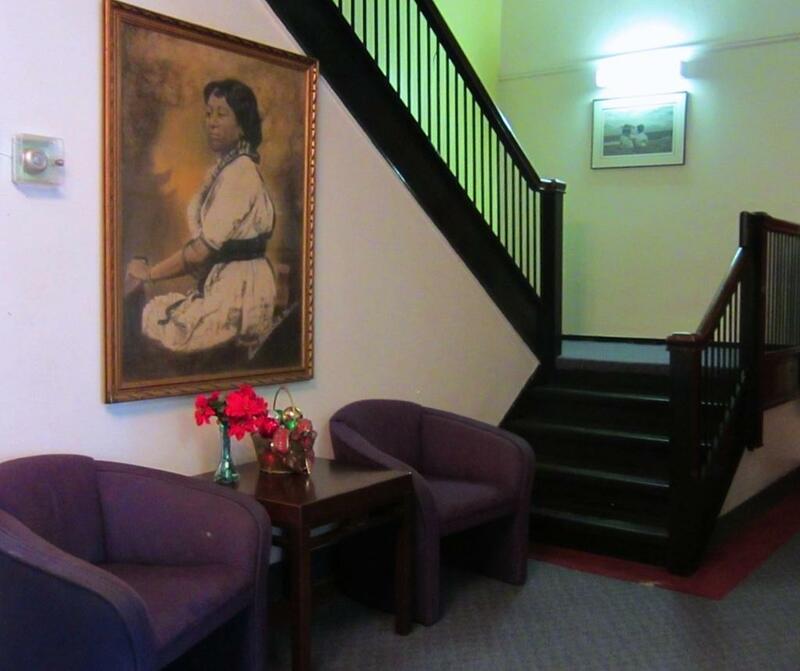 Throughout the Annie Malone complex, artwork reinforces the center's mission and provides a link to the past: paintings of adults with children; portraits of Malone; and period photographs, including shots of nurses at Homer G. Phillips Hospital. They may be brought by their parents or other guardians, perhaps because they are homeless or because the parent or guardian is ill or undergoing a crisis or there’s been a death in the family. They may be placed there by a juvenile court judge as an alternative to detention or as a transition to foster care. If the child is brought by a parent, he or she may stay 21 to 30 days. Children under court referrals may stay only five days before going back home or into foster care. Recently, a family of seven children ages 8 and under needed a place to stay for the weekend. “We were able to take them all, but I had to pull in staff” to meet the required adult-child ratios, Martin said. The center tries to create an atmosphere of home away from home, complete with adult supervision, a sympathetic ear and compassionate care. That part of the center’s mission has not changed. Lorna Lee, director of information technology and operations at the center, grew up in the Annie Malone Children’s Home in the building in the Ville, which is still the organization's headquarters. At one time, the Children’s Home housed up to 100 children who lived there for several months, several years or even most of their childhoods. 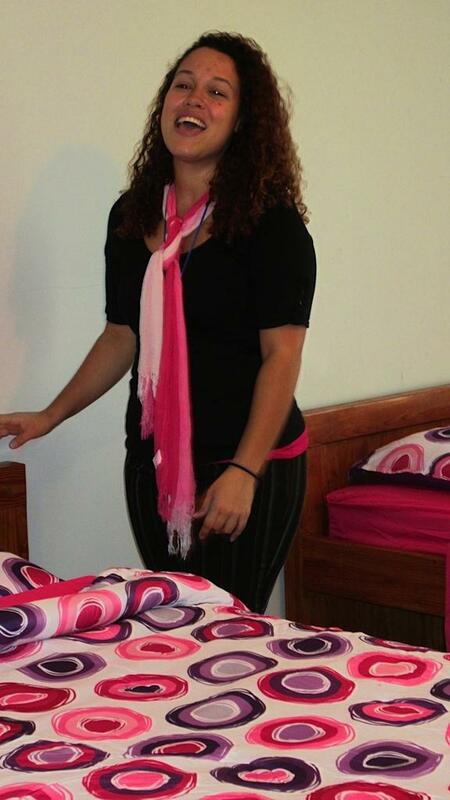 Lee lived in the Children’s Home for 15 years until she went to college. For much of her childhood, her twin brother and their two older brothers also lived there. A portrait of its namesake graces the reception area of the Annie Malone Children and Family Service Center at 2612 Annie Malone Drive. The building is on the National Register of Historic Places. Lee does remember field trips to a skating rink, Saturday ballet classes, and cross-country summer vacations in an RV complete with hotel stays and restaurant meals. “Annie Malone opened a lot of doors for me,” she said. Lee graduated from Kirkwood High School in the court-ordered desegregation transfer program and was named Magnet Journalism Student of the Year in 1989. She graduated from Lincoln University in 1994. Lee also took advantage of the Annie Malone Center’s Transitional Housing Program, which gives homeless young adults 18 and older a place to stay to get on their feet and move into their own apartments. The shift to shorter stays for children in distressed families has its drawbacks, Lee said. As the laws and funding sources have changed and the physical places of care have been moved, the organization has found stability in its staff and volunteers. The center’s chief executive officer, Angela Starks, is a prime example. Starks had marched in the Annie Malone Parade when she was a student at Soldan High School. But she didn’t make much connection to the Children’s Home until later, in 1977, when she had just delivered her first child at Homer G. Phillips Hospital. She looked out the window of her hospital room and saw the playground behind the Children’s Home. At the time, Starks was a graduate student at Saint Louis University, studying to get her master's degree in social work. “I saw the kids playing and I decided I would work there,” she said. She started at the Children’s Home in 1980. In her 32 years – so far – Starks has been a clinical social worker, program director of the crisis center, vice president of programs and planning, chief operations officer and, since March 2011, CEO. Lee remembers Starks as one of the adults who had a profound influence on her life. “She taught me about the birds and the bees,” Lee said. Starks said Lee tells that story often. Sarah Newton Cohron, who took in the first orphan girl and gathered women from the WCTU and nearby African Methodist Episcopal churches to do something for the orphans. Annie Turnbo Malone, who gave $10,000 in the 1920s to build a magnificent building designed by the famous architect William B. Ittner, who designed many schools in the St. Louis area. Teachers like Jonathan Haynes, who nurture the spark of learning in their students. Alumni like Lorna Lee who remember their years at Annie Malone and return as adults to give back.